The comb-generator SG 9302 C produces a frequency spectrum consisting of lines with 100 MHz spacing up to 18 GHz. In combination with an antenna it can be used as an emission source for testing open area test sites, anechoic chambers or GTEM-cells. Single components like measuring receivers, spectrum analysers, cables and attenuators can be tested as well. The comb generator SG 9303 is battery powered. It provides a frequency comb up to more than 8 GHz. The spacing between the spectral lines can be switched between 10 MHz and 100 MHz. A quartz crystal provides accurate frequencies. Due to its handy size and little weight as well as the mains independent power supply the SG 9303 is a great reference radiation source. In conjunction with a transmit antenna the comb generator plays the role of an artificial reliable EuT, while the rest of the fieldstrength measurement setup, consisting of receive antenna, cable, preamplifier and receiver or spectrum analyzer can be verified. 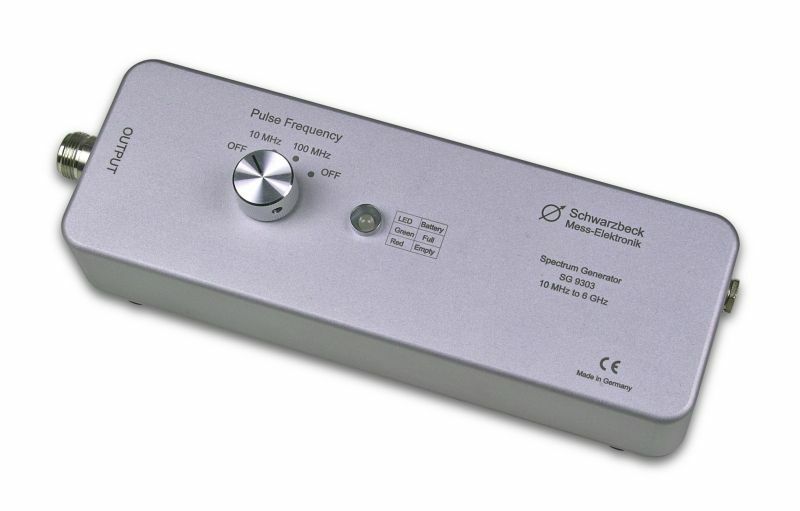 The SG 9303 is also suitable to check the functionality of EMI test receiver or spectrum analyzers. Cables and attenuators can also be tested.